Visit Evo Gear online at EvoGear.com for all your skateboarding, snowboarding, skiing, wakeboarding gear and clothing. At Evo Gear their aim is to bring all things relevant to the urban, action sports lifestyle into one creative space. Some of the brand carried by Evo Gear are 32, Fury, Plehouse Films, 4 FRNT, Garmont, POC, 686, Giro, POW, Absinthe, GNU, Powell Classic, Accurate, Goodwood, Powell Peralta, Adidas, Gravis, Primary, Airblaster, Habitat, Pro Tec, Alien Workshop, Head, Proline, Almost, Heart Films, Quicksilver and Alpine Initiative to name just a few. Save on your next purchase from EvoGear.com with Evo Gear discounts, Evo Gear coupons and Evo Gear savings from 58coupons.com. Enjoy free shipping on orders over $100 or more from EvoGear.com. Click link code to view. Hurry on over to Evo Gear to save an additional 25% off Outlet Items with this coupon code. Shop Evo Gear's Super Closeouts to save 60% or more right now. Click link to view. 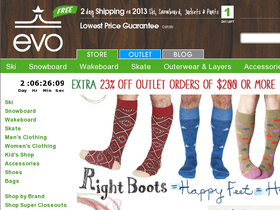 Get on over to Evo Gear to save up to 50% on their Winter Sports Liquidation items. We saw skis, goggles, ski boots, hoodies, gloves, helmets and much much more. Quantities are limited, click on the link to start saving now.